I’m talking about a literal trash costume. 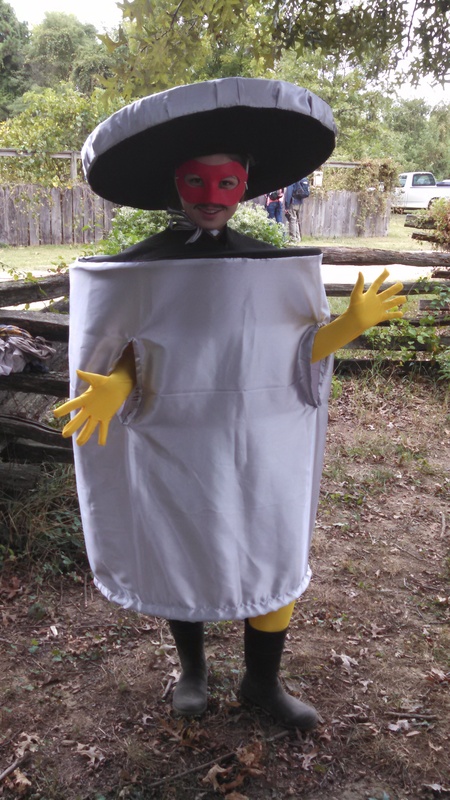 As in…I had to make a trash can costume. Earlier this summer, I had been tasked with creating a mascot costume for our big summer event, Celebrating the Potomac. The mascot in question for that event was Drip Drop, which is exactly what you would expect it to be. A giant raindrop. I was, apparently, the obvious choice to construct such a thing (and was assigned, later, to wear it). So I devoted about two weeks of my evenings to building a ridiculous getup out of pool noodles, duct tape, car headboard foam, blue jersey material, felt and plastic canvas. Because that’s the kind of thing I do. Drip Drop was such a hit with the programs department that they decided to enlist my help for a second mascot costume. This time, it was a trash can fiend (later given the name Phillip McCan), who would be part of a game at this year’s Food for Thought festival. Yes, that’s the same event I made crowns for, last year. The simple way to do this costume is pretty clear…you just get a large trashcan, cut some holes for the legs and arms, and make a face on the front. Having worn my share of costumes, though – and, truthfully, knowing the program staff – that just wasn’t going to cut it. I needed to make a costume that was lightweight, easy to maneuver in, and that could pack up small at the end of the event. I decided to use one of my favorite construction materials: hula hoops! They’re fairly inexpensive (you can usually find them at the dollar store), they’re sturdy, and they generally come in a couple of sizes. The hoops would form the basis of the top and bottom of the can, with a simple fabric tube creating the “body” of the can. Of course, I would need some way of suspending the can on the body of the wearer. I thought back to my Toad costume, years before. I had built a pair of fake suspenders, to hang the mushroomy bottom half of my costume from. It seemed like I should be able to do something similar here, with the trash can, but the challenge was that I needed to have the upper rim of the trash can reach up above the wearer’s head. I fretted about how to encase the wearer for a bit, before my problem was solved by a re-design by the program director. It was fine, she said, to have the wearer’s head visible, as she had to speak during the game and it would be easier to hear her if she wasn’t inside the can. That solved that! I gathered my supplies and began construction. 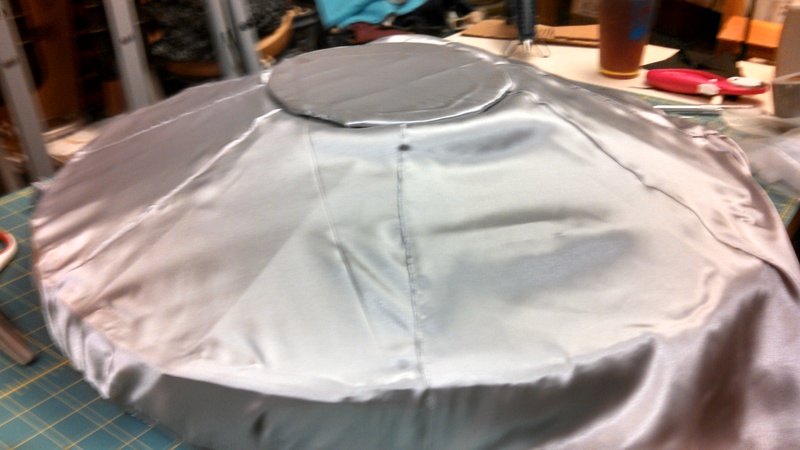 Stitching the silver tube to the felt-covered top of the costume. First step: open the hula hoops and empty out the small rocks which make that annoying sound when the hoops move. Since no one was going to be using these hoops for anything else, they didn’t need the movable weights inside. Then, I measured the circumference of the hula hoop and cut a length of fabric a little longer than the measurement. I adjusted the width a bit, so that the costume, when suspended from the wearer’s shoulders, would reach just past the knees but not all the way to the floor. I sewed a seam up the back, and then folded over each end to create a tube, like you might with an elastic waistband, making sure to leave an opening at one point. Then, I unlatched the hula hoops and threaded them into each end of the sewn tube. (from the inside, to hide the seam). 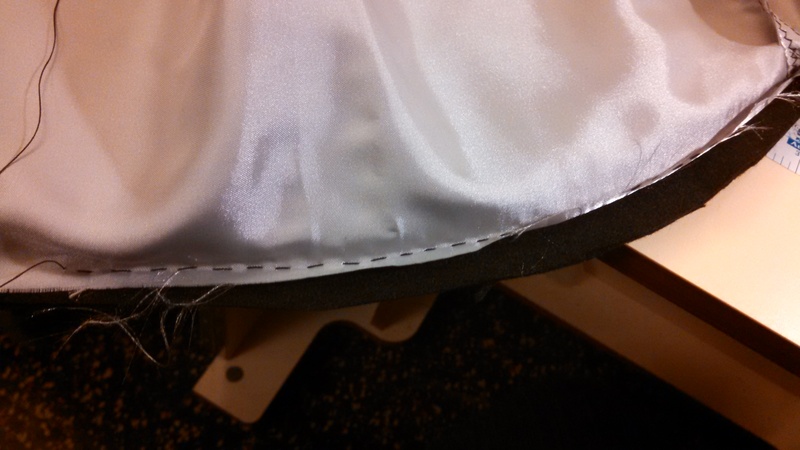 Since the fabric has a pretty slinky hand and frays more easily than I would like, I went ahead and used fray check to secure the edge of the top seam. Then, I flipped the costume right-side out and whipstitched the two half circles a little more close together, leaving enough room for the wearer to poke her head through. It was a little difficult to figure out where to place the arm holes. In the original sketch I was given, the arms naturally protruded from the sides. However, when the costume is worn, if the wearer’s arms come out of the side, they’ll pull the costume out of a can-like shape, and into a more hourglass-like shape. The character was going to need to interact with kids and pick things up from the ground, so the arms had to be in a good location to do that. They also needed to be able to pull plastic fruits and vegetables into the can, so the arm holes couldn’t be so small that they kept the wearer from being able to bring their arms in without help. I wound up cutting two slits at a halfway point between the center front and the side of each can. I stitched a bit of fabric around the edge, like a facing, to give the armholes a little more stability. And the body of the can was done! Underside of the lid hat, with convenient ties. Since the wearer was now using her own face, instead of having to put one on the can itself, I was able to make the trash can lid as a hat. I took a basic straw hat, of the sort you can purchase in the floral section of Michael’s. (Why it’s found in the floral section, I have no idea. I find it a bit ridiculous, too.) I measured out a circle of cardboard that was the same diameter as the hula hoops forming the top and bottom of the can and cut a hole in the center, for the crown of the hat to fit through. Then, I hot glued the cardboard to the top of the straw hat. 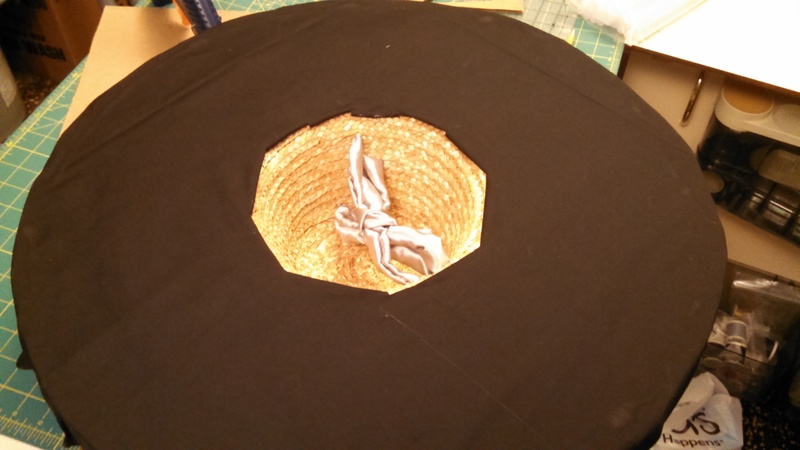 I cut another circle, a little bigger than the cardboard, out of black broadcloth and glued it to the bottom of the hat, hiding the straw underside. The edge of the fabric was then folded over and tacked into place on top of the cardboard. I cut some slits in the bottom of the fabric, tucked the raw edge under, and glued the edges in place, to open the inside of the crown back up for wear. A long tube of silver material, poked through the air grommets, provided a handy tie to affix the hat to the wearer’s head. Building up the inside of the hat. 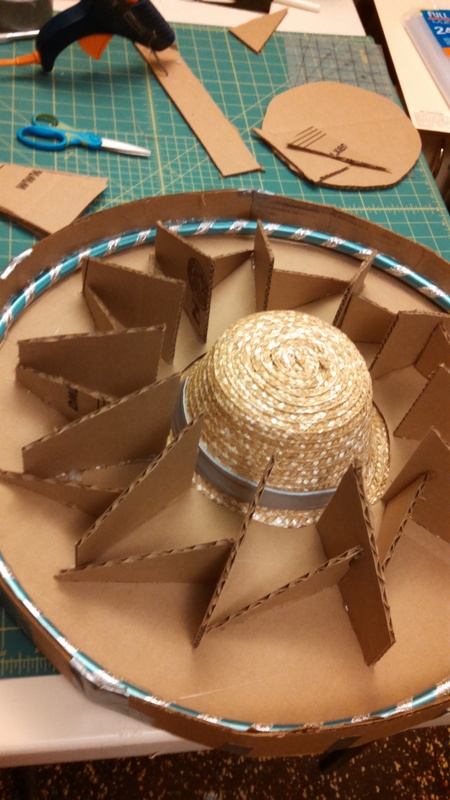 The cardboard “ramps” help support the top layer of the hat. cardboard circle, using three more hula hoops to stabilize the outer edge. Then, I began cutting out cardboard trapezoids, to begin building inner supports for the top of the lid. The supports all interlocked, and I did my best to have them meet up with a smaller cardboard circle I cut out for the center top part of the hat. I covered the circle with a little bit of spare batting I had sitting around, and then glued more of the silver material over top, to create the center piece of the hat. Then, I cut larger trapezoids that would fit together to create a sort of slope from the center of the hat, down to the outer brim. 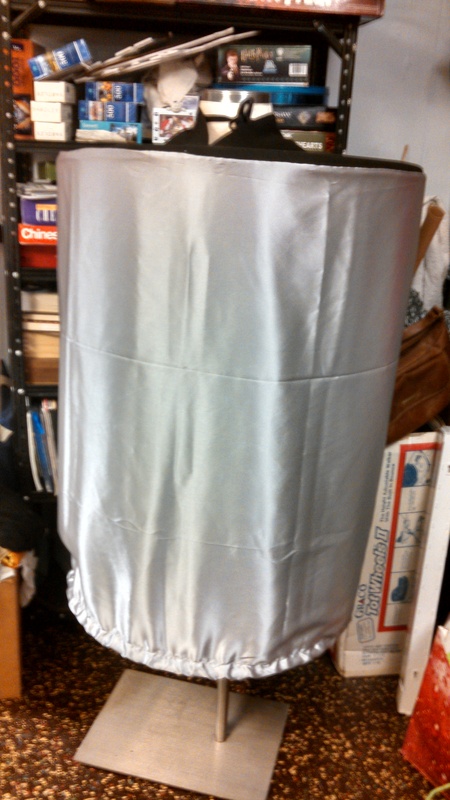 I cut one more big section of silver fabric and began pinning several pleats into place, shaping the fabric to give a more trash-can-lid shape. I stitched them in place using the machine and tacked everything back into place with a little more hot glue. Then, I turned the edges of the silver material under and whipstitched it to the black fabric underside. Voila! The majority of the costume was done! To complete the look, I got a mask from the craft store and painted it red, we purchased a yellow morphsuit from Amazon, and Kaylin (the interpreter in the costume) drew a fake mustache on with eyeliner pencil. This will, unfortunately, probably be the only costume I get to make this fall. I’ll just have to live vicariously through a trash can.